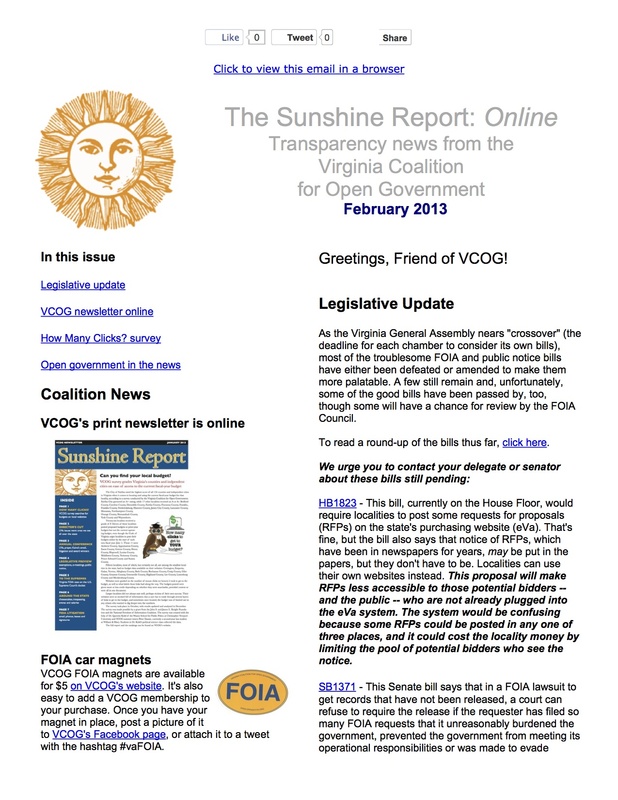 VCOG's print newsletter for Janaury 2013 -- litigation, How Many Clicks?, FOIA Council items and more. A friend of the court brief has been filed on behalf of VCOG and several state and national open government groups urging the U.S. Supreme Court to rule that Virginia FOIA's provision limiting the law's use to citizens of the Commonwealth is unconstitutional. The 4th Circuit said Virginia's provision was OK, while a 3rd Circuit decision a few years struck down a similar provision in Delaware law. At long last, the City of Hampton has completed its internal investigation of the Hampton Police Division's undercover cigarette trafficking operation. A state senator whose legislation set the stage for thousands of vital records in Virginia to be shaken loose; a citizens-group leader whose three-year battle over a wrongly withheld contract led to only the second known FOIA fee assessment; and a college newspaper whose FOIA-based reporting galvanized a campus community to put pressure on a powerful governing board. "The Freedom of Information Act is ridiculous"
....So says the head of UVA's council on foundations in an article on the Daily Progress' website. He says FOIA needs to be changed to allow freer conversations among members of a public body without triggering FOIA's rules governing open public meetings. Read the VCOG Blog's take on this. Read more about "The Freedom of Information Act is ridiculous"
The October issue of the Sunshine Report is online now. Blog posts, FOIA fines, intra-board lawsuit, opengovernment news and more. Open government advocacy groups, including VCOG and the National Freedom of Information Coalition, are asking the U.S. Supreme Court to rule unconstitutional those provisions of state public disclosure laws that allow only states' own residents access rights to public records. "Virginia's law fails to realize that people's interest in localities and states does not end neatly at the geographical borders," said Megan Rhyne, executive director of Virginia Coalition for Open Government, a member of NFOIC.